As Shawn Dubravac wrote in Digital Destiny, "Humanity is entering a new era. Beyond the mere acquisition of ever more digital devices with ever more incredible functionality, the immediate future will usher in the all-digital lifestyle and an 'Internet of Everything.' The transformation of our lives will be breathtaking." Now comes the critical question, what are you, as a leader of your organization going to do --transform, or die a slow, painful death? While there are already thousands of pages of literature on what is happening, this is the first book that goes beyond the "what" and on to the "how" of digital transformation for extremely busy leaders. There are no cookie-cutter approaches, but each organization needs high level, strategic guidance on how to approach Digital Transformation. But wait, extremely busy leaders of our organizations don't have time to digest the proliferation of literature on this vital subject. It took considerable effort to condense Digital Transformation into a powerful guide for the incredibly busy leaders of organizations. As Francis Bacon once wrote, "Some books should be tasted, some devoured, but only a few should be chewed and digested thoroughly." 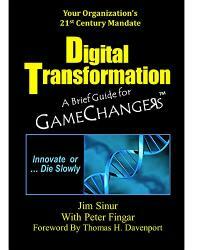 This very concise book is the one for busy executives, the Game Changers, to digest-- and act on!